← Awesome Treat Alert: Stella & Chewy’s!!!!!!!! 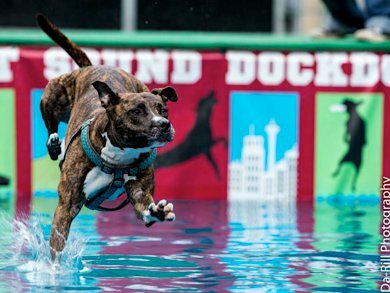 Seattle Weekend Dog Events Oct 5-7! This organization uses therapy dogs to help kids have confidence while working on their reading skills. It’s a brilliant program that really helps kids and reminds us of how powerful dogs can be in helping us deal with difficult life challenges. So in this case, the kids are awesome for making the effort, and the dogs are awesome for being there! Reading with Rover will hold two sessions on Saturday, October 6th from 11am-12noon at both the Snohomish Library and the Edmonds Library. For more information visit the Reading with Rover’s events page. This event celebrates the launch of Blue Dog Bakery’s Pet Treat Pantry program which helps place healthy pet treats in the food pantries around the country so that both people and pups can get a little help in tough times. There will be live music, a caricature artist, complimentary dog nail clipping and brushing, and food for all. Great cause and sure to be a fun event!! Does your dog dive? Does your dog totally get stoked at the prospect of fetching and retrieving stuff floating in the water?! Mine doesn’t. But if yours does, you should try entering the Dock Dogs canine aquatics competition in Issaquah this weekend. There will be Big Air, Speed Retrieve Wave, or Extreme Vertical competitions. Any one can enter as long as your dog is a good swimmer and loves bringing toys out of the water. And even if that isn’t your pooch’s thing you can have fun watching those other dare-devils! Register and get more information at the Dock Dogs site. Posted in Community Event, Competition, Dogs, Event. Bookmark the permalink.